Sharath Koppu, 25, was shot and killed inside J’s Fish and Chicken Market Friday, July 6, 2018, according to Kansas City police. Another international student, Sharath Koppu, who arrived in January in the US to begin his Master’s degree in computer science at the University of Missouri-Kansas City, has fallen victim to the USA’s endemic gun violence. The above headline was the title of an article that appeared in The Times of India on 8 July 2018. The quote, which was the first comment, sums the reaction of many, be it on a short- or long-term basis. More young Indians will think twice before choosing the USA as an overseas study destination. The shift to Canada and other countries was already taking place and incidents like these only serve to hasten that process. Last year, two Garmin engineers, also originally from India, were shot by angry white man yelling “Get out of my country!” One succumbed to his injuries. It doesn’t matter that the latter was a hate crime while the former a murder committed during a robbery. The end result is the same: they’re both DEAD. Sharath Koppu is an Indian Computer Engineer who came to the USA in the month of Jan 2018. Sharath is known to his family and friends as full of dreams, cheerful, energetic and athletic. In the pursuit of his dreams, he moved to USA to do his Masters. He had the same dreams like everyone else to make it BIG in the land of opportunity. He had a great sense of humor, and always made people laugh and was always eager to lend a helping hand. Little did anybody know that life is about to take a big unfortunate turn on a fateful day of July 6th 2018. With more than 260,000 students from China and India enrolled in the US, many American institutions are over-reliant on these two markets for meeting their international student recruitment goals. With the budget cuts, self-financed students are becoming increasingly important and Chinese undergraduate students are a lucrative and fast-growing segment. However, there are already concerns about concentration of Chinese students in some campuses and India had been showing stagnancy in last few years. This indicates that institutions need to look beyond China and India and cultivate other source countries. At another level, there is a “stock market” mentality emerging in international student enrollment domain where stakeholders closely watch annual shifts in enrollment figures. However, it is important to look into long-term trends of emerging and declining markets. Here are some contrasting trends with four markets–two declining and two growing. Japan and Indonesia have declined quite drastically. Decline in Japan is a due to changing demographics resulting in decline of college going pipeline. For Indonesia, decline in US numbers could be explained by attractiveness of Australia and Malaysia due to cost and proximity. Indonesia is second largest source country for Malaysia and third largest source country for Australia. 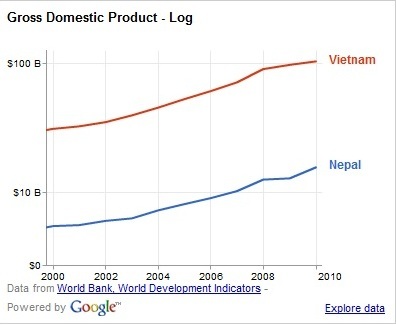 In contrast to Japan and Indonesia, Nepal and Vietnam have shown robust growth over a decade. Vietnamese students in the US have grown by more than six times in a decade. Even Australia gained from the demand of Vietnamese students by 167% in four years from 9,634 in 2007 to 25,788 in 2010. Likewise, Nepalese students in the US have grown by nearly three times in a decade. Australia saw a strong growth in Nepalese students from 9,106 in 2007 to 22,019 in 2010 (142% in four years). This growth in internationally mobile students from Nepal and Vietnam is primarily driven by growing aspirations of expanding educated classes which in turn is supported by economic development. Both Vietnam and Nepal saw their GDPs grew by nearly three-times in a decade. Note: This is obviously a static image. (I’m having a problem importing the “plugin” that I need to make this work properly.) If you are interested in exploring the data, click here.